I'm not on Facebook. I've never been on Facebook. I had never planned on being on Facebook. Only something recently tempted me... But more on that later. Mr TBT had never been on Facebook either. Then he misplaced a friend. Dear ol Douglas went off to work in India. All good and well. We had the odd email, the occaisonal phone call and all was well. Then Douglas (and family) went off to work in Mongolia. Where he disappeared off the planet. Not a word. Zip, zilch, nada. In fact, nobody had heard boo. "There's only one thing for it" I said to Mr TBT, one morning. "You'll have to join Facebook to find him"
"Nah, she'll be right". Weeks past. Months even, still no word. "Bugger. I'll have to join Facebook" he said. "Bingo! I found him". Now I'm not saying Facebook doesn't have a roll. It did the trick. But then Mr TBT recieved a flurry of messages. Most either chastising him for joining the dark side (!!) or messages that were completely irrevelvant, inappropriate or downright boring. "I'm going to close my account" he said. Easier said than done. Several hours later (and lots of rude words) he closed his account. "Damn you Facebook" he said. Fast forward a couple of years and Mr TBT updates my phone for me. Except something goes woefully wrong and the whole phone is wiped. Friends phone numbers, Arthur's baby pictures-all gone. "You'll have to get on Facebook" I say, innocently. "Bugger off" he said. (By the way, if you haven't heard from me in a while, please get in touch. I've lost all my phone numbers, and I'm not on Facebook). So, thus far I've been quite proud not to be on Facebook. I have had to get friends to get information for me from businesses who only have Facebook accounts. (If you are one of those businesses, please spare a thought for those of us living in the dark age. Please make your page with public access). The lovely people over at My Bearded Pidgeon are having a giveaway. I thought it woukd be perfect caravan decor (remember my secret desire to whip the kids away on s little road trip. Around Australia.) Only thing is, you have to be on Facebook. Or Twitter. Or Instagram. Or Piniterest. I'm not on any. Boo hoo for me! Actually I did make a twitter account once. But I've never use it. I don't even know the login. 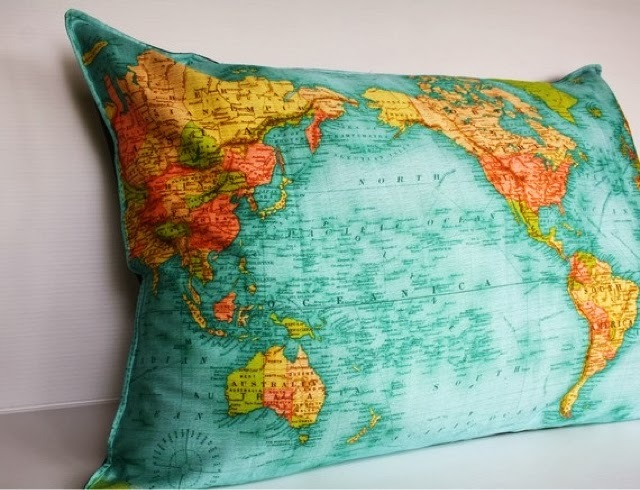 I also love this world cushion. Not to mention this lovely one. If you want to pick up one of these beauties, head over to the My Bearded Pidgeon etsy shop here. 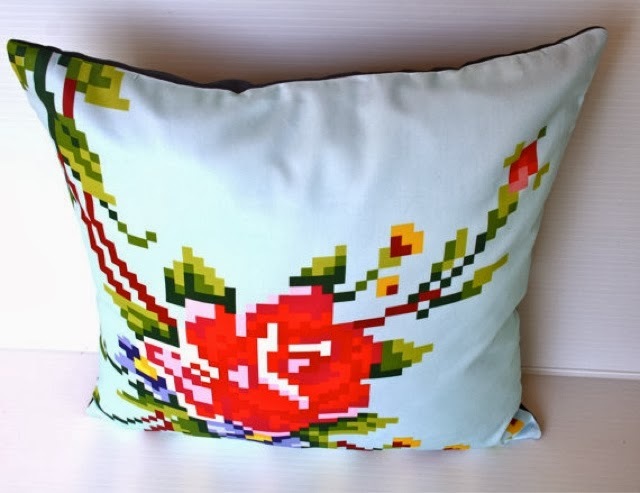 If you are lucky enough to be on Facebook, Instagram, Piniterst or Twitter and want to win yourself a cushion go the their blog here. 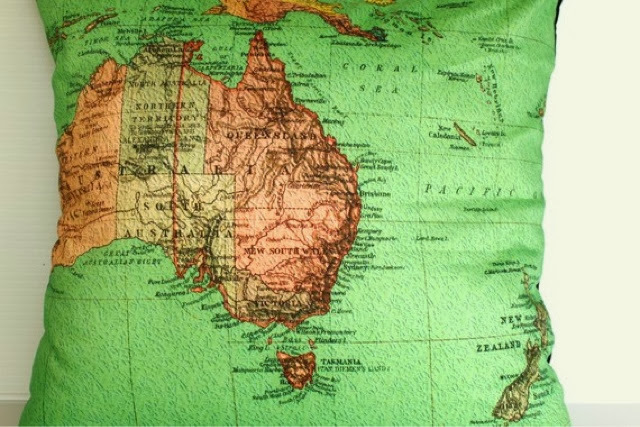 Australia Day - To BBQ or Not To BBQ?